The weather is finally warming up and we are starting up a few house projects that we’ve been wanting to do since we turned the key in December. I will write a couple more posts about various things we’ve done inside and outside, but I wanted to start with the basement. Now, we haven’t done a whole lot to it since we moved in, but Jay has managed to add a few more things so I thought I would show them off. This is the hangar. 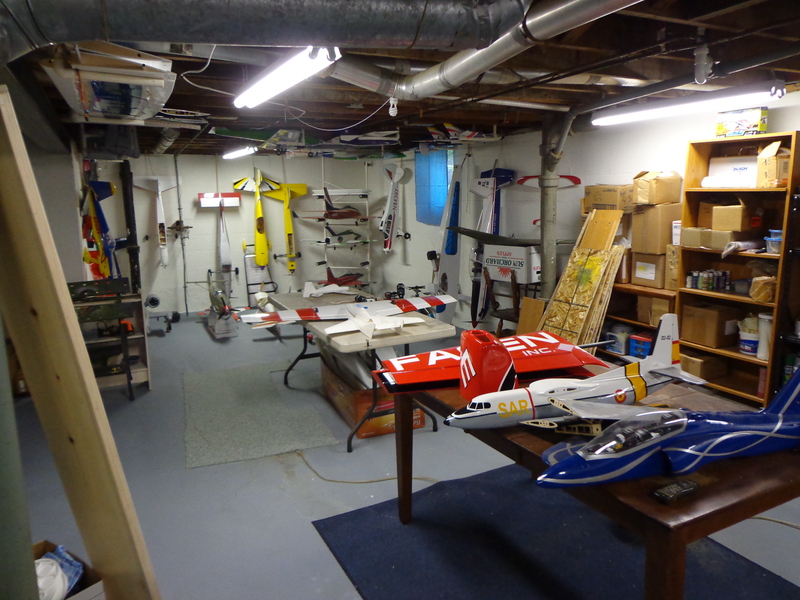 He put his PVC pipe jet holder in the very corner, hung some more PVC on the floor joists to hold more jets, and found places along the wall for some of the other planes. 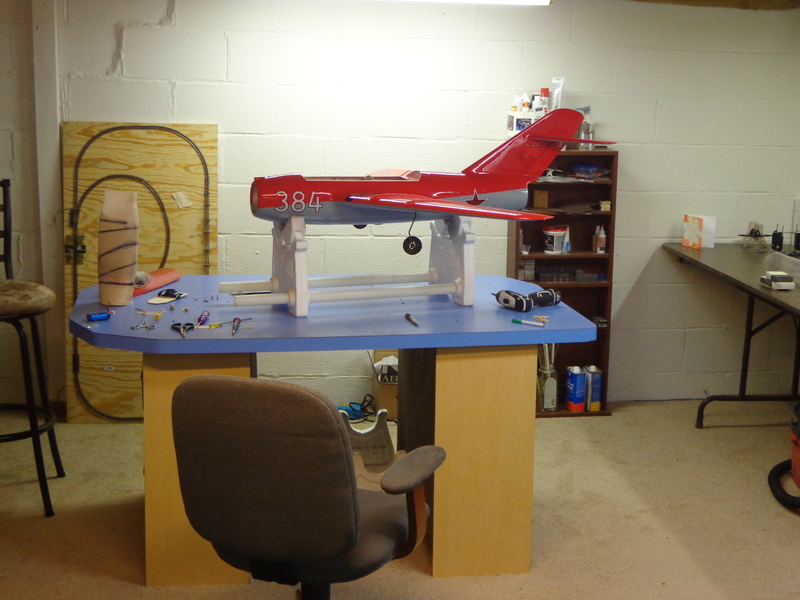 He also has a work table set up on the rug where he can spray paint or spread out a large project for more room. It also enables him to have yet one more project in limbo without taking up space in his actual workshop. 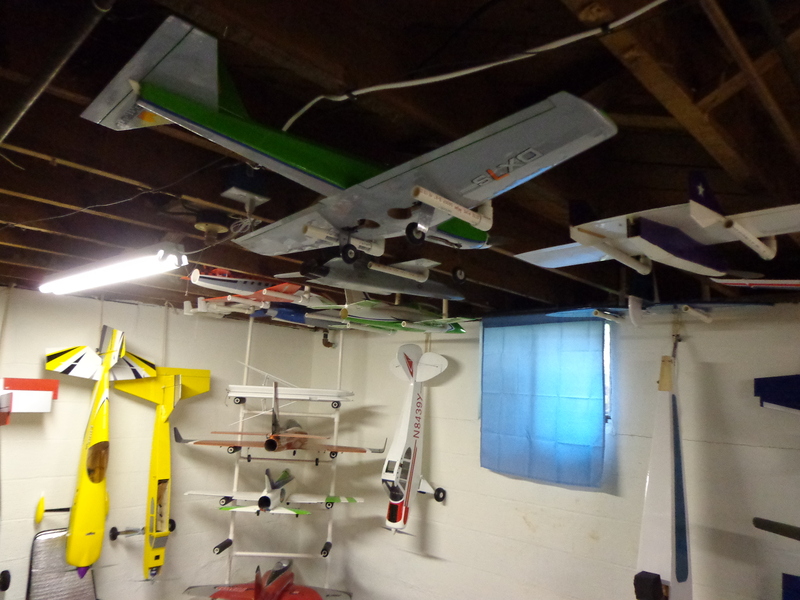 This is to show you how he hangs his planes from the floor joists. He also sets up PVC brackets like this for the large one-piece wings, like what goes on the LT-25 and my Miavalier (the Miami Dolphins Kavalier). There are a couple of his birds that reside on the floor, such as the A-10 and his gas-powered helicopters. Oh, and the watermelon combat foamie! You can see the one-piece wings hanging from the floor joists in this picture, too. Despite his ability to hang planes, there is still a little bit of spillover. I have no idea where these ones will end up, but I’m sure that there’s a plan for them. If you are wondering, I believe that everything in the last couple of pictures is ready to fly. All you should have to do is toss a battery in them and that’s it. Jay doesn’t like to be bored so he likes to keep different ones on hand depending on what he’s in the mood to fly. 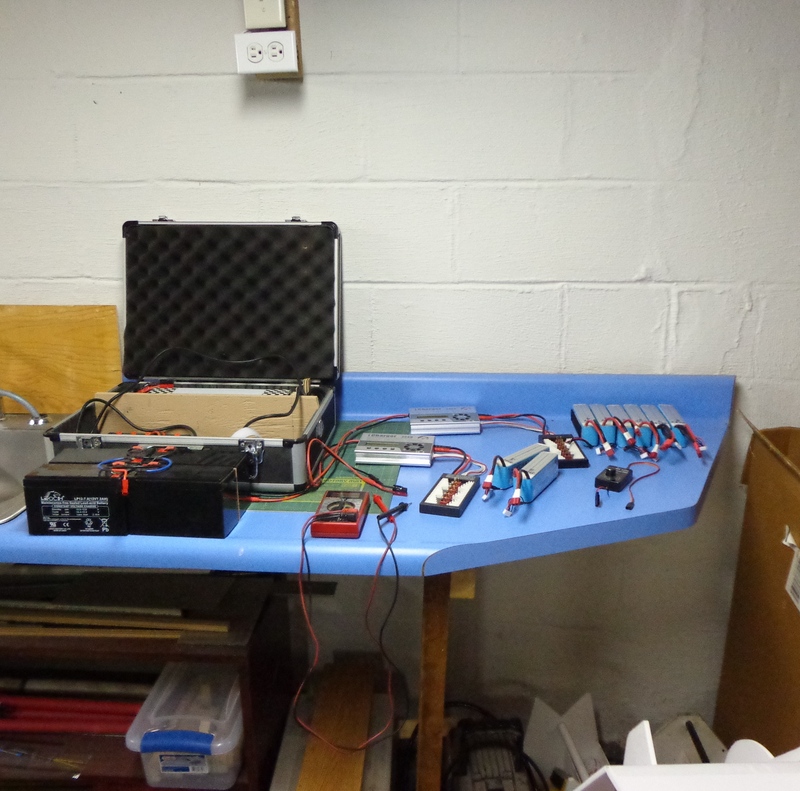 Here is the new battery charging station that he wired up. There’s a switch attached to the outlets so if something should get overheated or start on fire, you flip the switch and all power is shut off. This way you don’t have to worry about trying to pull batteries off of the charging boards. It’s quite a good idea. 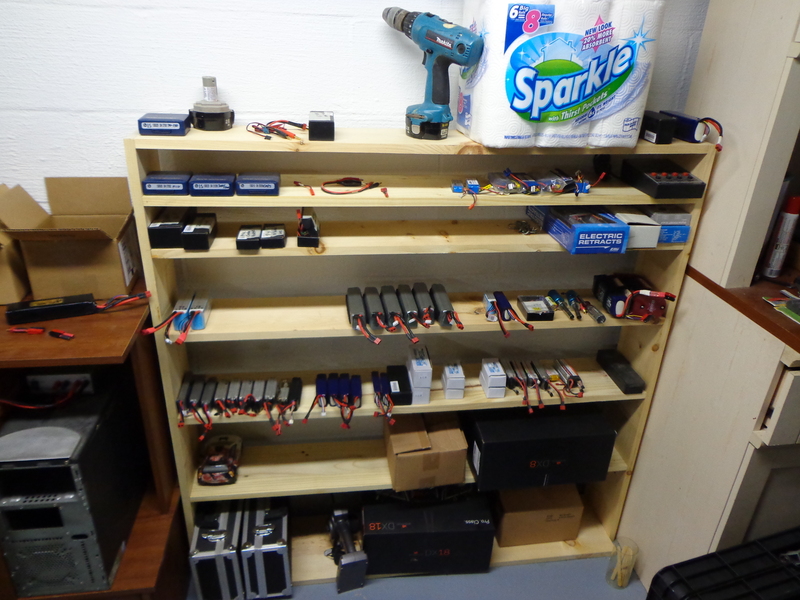 Then, of course, you have the battery storage area. No, those aren’t all of the batteries he owns. In fact, I don’t see any of his Glacier batteries on there. Those are his new favorite brand of battery and the guy from whom he buys them has EXCELLENT customer service. If you’re in the market for batteries or a new charger you must check out EPBuddy. Jay’s workshop hasn’t changed much. The only thing that usually changes is the particular model that he is working on. He has to do some touch-ups on the MiG because something happened with the nose gear. He told me what it was, but I’ve already forgotten. All that I know is he will have it fixed shortly. This is one of his favorite jets so I know that it won’t be up on blocks for long! 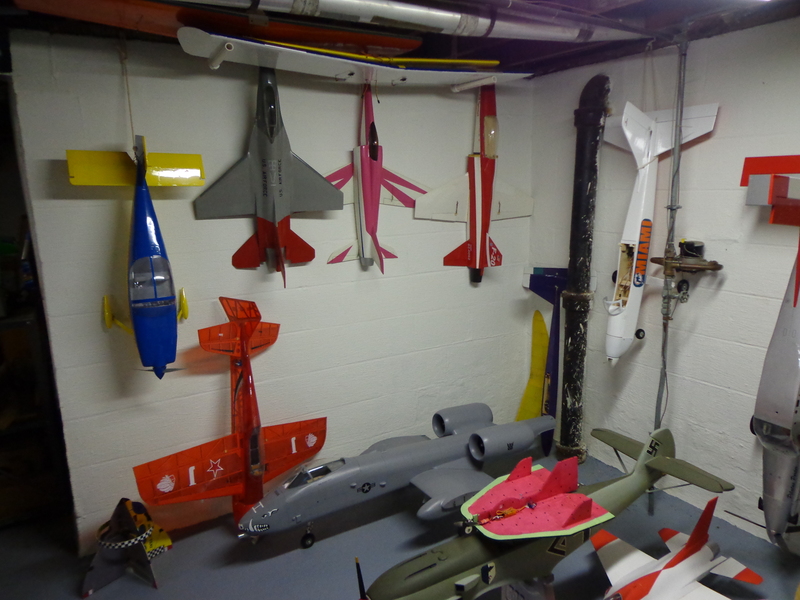 I hope that you enjoyed a look at Jay’s Hangar. Coming soon will be pictures of our outdoor changes and an update on our bathroom. Yeah! 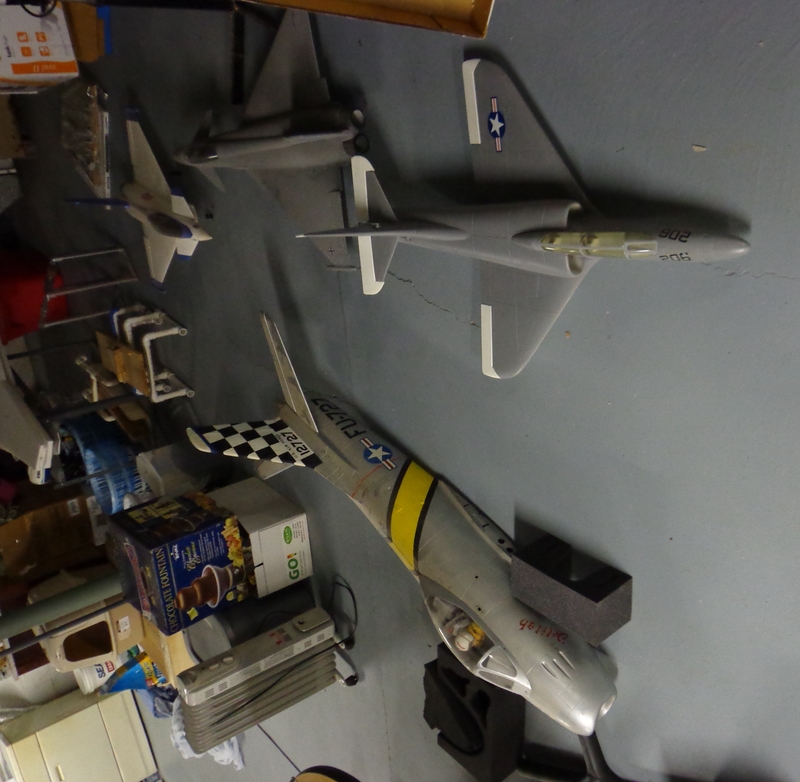 This entry was posted in A-10 Warthog, EDF, Jets, My House, RC Planes and tagged EPBuddy, Jets, My House, R/C, RC Planes. Bookmark the permalink.